Thanks to the financial support from the greater Kansas City community and friends, the Edwards Campus is thriving and planning to expand facilities and programs to respond to the growing workforce and community needs. 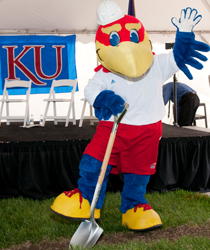 To meet its future objectives, the KU Edwards Campus seeks the vital support of corporations, organizations, alumni and friends through their contributions to The Kansas University Endowment Association. The Edwards Campus has identified a number of projects as priorities. You can make a difference.